Do you have a few moments to spare? Perhaps when travelling on a bus or train, waiting for a lecture or in a checkout queue? The purpose of these apps is to help you revise your biochemistry. Down load it to your smart device and revise in your spare moments. Apps include Revise! :Glycolysis ; Revise! :TCAcycle ; Revise! :Pentose Phosphate Pathway . Each app has several routes. One will help you learn the topic with helpful tips and mnemonics to aid memory. The other routes will test you thoroughly on the topic. 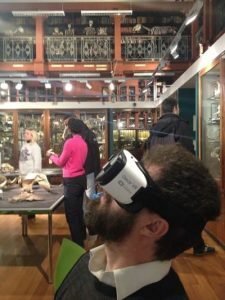 The Grant Museum of Zoology worked together with UCL’s Life and Engineering Sciences to explore how VR can extend and enhance the experience of its visitors. The initial stages of the creation of our VR experience, VR:Cell, involved academic input, planning and concept development by Professor Matilda Katan from UCL Biosciences. Product development was made possible by two committed and eager-to-learn startups, The Body VR LLC and PlanetTechNews Ltd.